Production: Buster Keaton Productions and United Artists; black and white, 35mm, silent; running time: about 74 minutes; length: 8 reels, 7500 feet. Released 18 December 1926, New York. Rereleased after 1928 with musical soundtrack and sound effects. Filmed during 1926 in Oregon. Cost: $250,000 (estimated). Producers: Joseph Schenck and Buster Keaton; scenario: Al Boasberg and Charles Smith after a storyline by Buster Keaton and Clyde Bruckman, adapted by Al Boasberg and Charles Smith from The Great Locomotive Chase by William Pittinger; photography: Dev Jennings and Bert Haines; editors: Sherman Kell with Harry Barnes; production designer: Fred Gabourie; technical director: Fred Gabourie. Cast: Buster Keaton ( Johnnie Gray ); Marion Mack ( Annabelle Lee ); Glen Cavender ( Capt. Anderson ); Jim Farley ( General Thatcher ); Frederick Vroom ( Southern general ); Charles Smith ( Annabelle's father ); Frank Barnes ( Annabelle's brother ); Joe Keaton, Mike Denlin, Tom Nawm ( Union generals ). Keaton, Buster, and others, "Le Mécano de la General ," in Avant-Scène du Cinéma (Paris), February 1975. Keaton, Buster, with Charles Samuels, My Wonderful World of Slapstick , New York, 1960; London, 1967. Turconi, Davide, and Francesco Savio, Buster Keaton , Venice, 1963. Lebel, Jean-Patrick, Buster Keaton , Paris, 1964. Oms, Marcel, Buster Keaton , Lyons, 1964. Blesh, Rudi, Keaton , New York, 1966. McCaffrey, Donald, Four Great Comedians , New York, 1968. Robinson, David, Hollywood in the Twenties , New York, 1968. Robinson, David, Buster Keaton , London, 1968. Brownlow, Kevin, The Parade's Gone By , London and New York, 1969. Rubinstein, E., Filmguide to The General , Bloomington, Indiana, 1973. Coursodon, Jean-Pierre, Buster Keaton , Paris, 1973; revised edition, 1986. Mast, Gerald, The Comic Mind: Comedy and the Movies , Chicago, 1974; revised edition, 1979. Kerr, Walter, The Silent Clowns , New York, 1975. Anobile, Richard, editor, The Best of Buster , New York, 1976. Wead, George, Buster Keaton and the Dynamics of Visual Wit , New York, 1976. Moews, Daniel, Keaton: The Silent Features Close Up , Berkeley, 1977. Wead, George, and George Ellis, The Film Career of Buster Keaton , Boston, 1977. Dardis, Tom, Keaton: The Man Who Wouldn't Lie Down , New York, 1979. Benayoun, Robert, The Look of Buster Keaton , Paris, 1982; London, 1984. Brunovska Karnick, Kristine, and Henry Jenkins, editors, Classical Hollywood Comedy , New York, 1995. Mead, Marion, Buster Keaton: Cut to the Chase , New York, 1995. Oldham, Gabriella, Keaton's Silent Shorts: Beyond the Laughter , Carbondale, 1996. Amiel, Vincent, Corps au cinèma: Keaton, Bresson, Cassavetes , Paris, 1998. Knopf, Robert, The Theater and Cinema of Buster Keaton , Princeton, 1999. Variety (New York), 9 February 1927. Keaton, Joseph, in Photoplay (New York), May 1927. Penelope Houston, in Sight and Sound (London), April-June 1953. Agee, James, Agee on Film 1 , New York, 1958. "Keaton Issue" of Cahiers du Cinéma (Paris), August 1958. Bishop, Christopher, "The Great Stone Face," in Film Quarterly (Berkeley), Fall 1958. Baxter, Brian, "Buster Keaton," in Film (London), November-December 1958. Strick, Philip, in Films and Filming (London), September 1961. "Rétrospective Buster Keaton," in Cahiers du Cinéma (Paris), April 1962. Sadoul, Georges, "Le Mécano de la General ," in Lettres Françaises (Paris), 28 June 1962. Eyles, Allen, in Films and Filming (London), October 1963. Gillett, John, and James Blue, "Keaton at Venice," in Sight and Sound (London), Winter 1965–66. Sadoul, Georges, "Le Génie de Buster Keaton," in Lettres Françaises (Paris), 10 February 1966. Mast, Gerald, " The Gold Rush and The General ," in Cinema Journal (Evanston, Illinois), Spring 1970. Villelaur, Anne, "Buster Keaton," in Dossiers du cinéma: Cinéastes 1 , Paris, 1971. Sarris, Andrew, "Buster Keaton," in The Primal Screen , New York, 1973. Cott, Jeremy, "The Limits of Silent Comedy," in Literature/Film Quarterly (Salisbury, Maryland), Spring 1975. Wead, George, "The Great Locomotive Chase," in American Film (Washington, D.C.), July-August 1977. Warshow, Paul, "More Is Less, Comedy and Sound," in Film Quarterly (Berkeley), Fall 1977. Kirby, Lynne, "Temporality, Sexuality, and Narrative in The General ," in Wide Angle (Athens, Ohio), vol. 9, no. 1, 1987. Yperen, Paul van, "Het affiche: The General ," in Skrien (Amsterdam), no. 166, June-July 1989. Sanders, J., "Dreaming in Pictures," in Film Quarterly (Berkeley), vol. 47, no. 4, 1994. Rohmer, Éric, in Positif (Paris), no. 400, June 1994. Horvath, G., "Almomban Keaton," in Filmvilag (Budapest), vol. 38, no. 12, 1995. 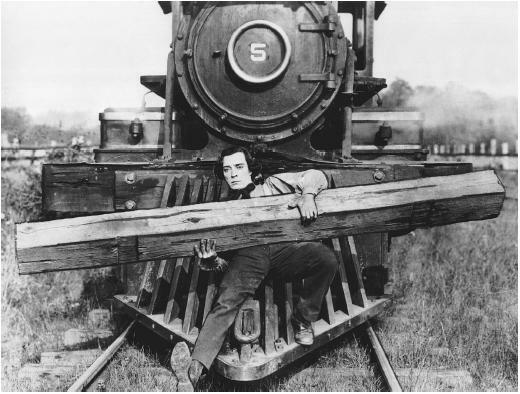 The General is by far the most famous of the comedy features in which Buster Keaton starred, and in several cases directed or co-directed, between 1923 and 1928. It is also one of the finest, and has appeared on many 10-best-films lists. All of his silent features followed a basic story formula (a popular one in silent comedy): a young "failure" finally displays prowess and wins the girl. In addition, his films demonstrated, in part or in whole, a striking cinematic imagination as well as superb comic acting. While The General may not be a greater artistic achievement than The Navigator or Sherlock, Jr. , it has a number of features that have made it a special favorite of silent film fans. The film is distinctive for its Civil War setting and location shooting. It was shot mostly in Oregon, where the necessary narrow-gauge railroad tracks were still to be found. (Compare, for contrast, the studio look of Chaplin's The Gold Rush , made at about the same time.) The unusually fine photography (Matthew Brady comparisons are inevitable), the extensive action involving the trains, the ambitious subject based on history (the theft and recovery of the locomotive, "The General"), and the serious element of the drama combined to give this film an epic sweep that is surely unique in silent comedy. In the typical Buster Keaton comedy the hero is at first anything but heroic: he is callow, bumbling, and even in some films effete. Through perseverance, self-teaching, and luck he becomes a success and—sometimes as a bonus but usually as the original goal—he is united with the woman of his dreams. The General is distinctive in that Johnnie Gray is an expert in at least one field, railroad engineering. In fact his competence at his job is what prevents him from being accepted into the Confederate army, setting the rest of the plot in motion. Of course, he must still demonstrate bravery to win the heart of Annabelle Lee; and, to satisfy himself, must succeed as a soldier as well. To be sure, even in railroading he makes some spectacularly comic mistakes in pursuing the Yankee train-nappers. He does, however, demonstrate early on the kind of hilariously smooth efficiency that other Keaton characters learn only with time (as in The Navigator ) or achieve in fantasy ( Sherlock , Jr. ): e.g., his clambering aboard The General and pressing the starter lever in one swift movement; or his deft way of knocking out a Yankee guard face-to face. The unself-conscious heroism and expertise of Johnnie Gray are simultaneously touching and amusing—though much of his success is also due to good fortune (as with the flyaway blade of his sword in the battle scene). The heroine of the film, delightfully played by Marion Mack, has a larger and more unusual role than in the other Keaton features (excepting The Navigator ). Usually a Keaton heroine is either haughty or sweet, but in each case little more than the goal to be attained; Annabelle is forced by circumstances to become skilled in railroading while fleeing southward with The General. There is some stereotyping of the foolish female in some of Annabelle's earlier efforts to block the pursuers and feed the engine, but the evolving of her role from the "unattainable goal" to a partner in action is still refreshing. The moment in which the exasperated Johnnie feigns strangling his dream girl and then swiftly kisses her is one of the more memorable romantic gestures in silent film. The General is filled with surprising moments: brilliant comic gags or fine touches of sentiment that never go on long enough to become maudlin. Perhaps the comedy is especially striking because it grows out of a serious melodramatic pursuit—but it is particularly satisfying because it stems from the characters of the hero and heroine or from the ironic perspective of the camera. The point has often been made that the camera in Chaplin's films was used mainly to record the body or facial movements of its pantomime hero, while in Keaton's film the comedy often depends on special placement of the camera, or on special visual effects. A classic example in The General occurs when Johnnie has accidentally caused the cannon attachment to be aimed directly at his own train. However, he and his train are spared, and better yet, the Yankees are convinced of the powers of their pursuer(s), when the forepart of Johnnie's train curves left and the cannon fires directly ahead—nearly blasting the back car of the train on the track ahead. The elegance of the gag centers on the placement of the camera behind and above the cannon car, grandly recording the beautifully timed action in one shot. Another famous moment in the film—this one visually simple and emotionally complex—occurs when Johnnie, rejected by Annabelle, sits disconsolately on the crossbar of the engine's wheels as the train starts up. The crossbar carries him up and down twice before he realizes what is going on. His forlorn, unmoving body posture is at once astonishingly sad and funny; any drift into sentimentality is avoided by Johnnie's suddenly aware look as he passes into the train shed. The overall wit and irony of the shot are dependent on the camera being placed at a sufficient distance to show the small size of Johnnie's body against the sublimely indifferent machine. Much more could be said about this shot, and has been said by analysts of the film: e.g., the way it stresses a "togetherness" between Johnnie and his beloved engine, which is a major subject of the film; and the way that the final shot of the film is a counterpart to it, with both Johnnie and Annabelle sitting on the crossbar. This correspondence of shots is a reminder that the construction of the film is unusually tight and balanced in its overall arc of chase and return. The more one attempts to analyze the comedy, or merely describe certain brilliant shots—such as the one of Johnnie on the cowcatcher removing logs from the tracks—the more one admires the classic assurance and economy of the film.